February | 2012 | Can't Believe It's Allergy Free! This is a great family dish. Even if non allergic people want to have it with egg noodles, rice noodles will be an ideal accompaniment for anyone with allergies. Whichever way, the whole family can eat together, as the turkey meatballs are safe to have and are delicious. Line jelly roll pan with foil. Grease foil with a small quantity of oil, or use a cooking spray. In a large bowl,combine ground turkey, cornflake crumbs, applesauce, salt, corn-starch, garlic, parsley and sage. Mix well. Place meatballs about an inch apart, in prepared pan. Roast meatballs 20 minutes, or until they lose their pink color throughout. In a medium saucepan, combine cranberries, water, sugar and cayenne pepper. Cook 5-7 minutes, stirring occasionally, until mixture thickens slightly. To serve, place prepared noodles on individual plates. Top with meatballs and cranberry sauce. 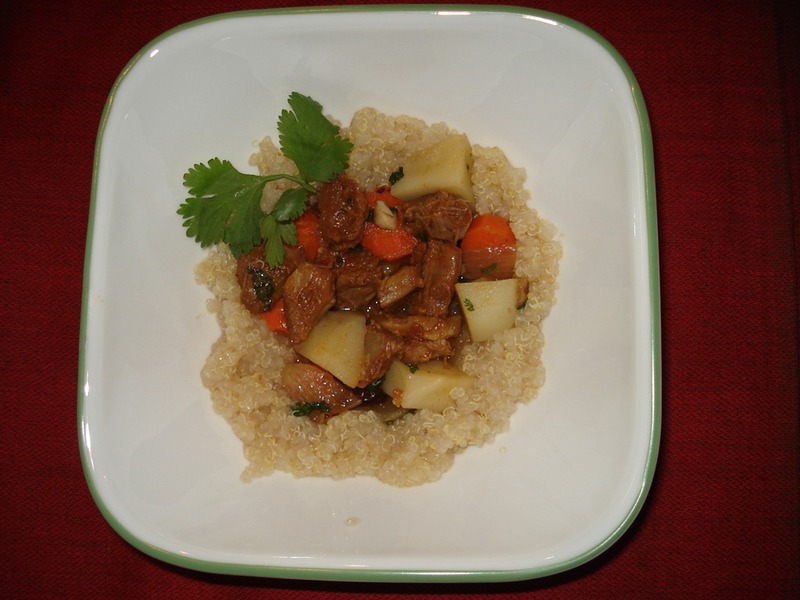 This dish has an exotic middle Eastern flavor and is great served with quinoa, the ‘super’ grain. It is a one dish meal with lots of nutrition and flavor. Add lamb and stir fry till meat is browned. Add garlic and ginger and stir for another minute. Add 1 cup water, cover and cook for 15 minutes. Add carrots, turnips and potatoes. Add 1/2 cup water, bring to a boil and let simmer, covered, for 10 minutes on medium heat. Remove lid and check in between to make sure that water is sufficient (add more if required). Add zucchini and raisins and continue to simmer for 10 minutes more or until lamb and vegetables are cooked. Add salt, curry powder and fresh cilantro leaves. If there is more liquid, and you would like to thicken the stew, mix a little corn-starch in cold water and add to the stew, stirring all the time, till sauce thickens. Gently wash and rinse quinoa in water and pour through a fine strainer. Repeat process two or three times. Slowly pour the rinsed quinoa into the water. Cook uncovered on low heat till most of the water is absorbed. Cover and cook for a few more minutes, till quinoa grains are fluffy. Pile some quinoa onto a serving platter and make a well in the center. Arrange the stew in the center. These are all time favorites and good for snack time to give that extra bit of energy. In a bowl, sift together flour and baking soda. In a large bowl, beat butter using a mixer and add prepared Egg Replacer. Gradually add both the confectioner’s sugar, then the granulated sugar. Beat in oil and vanilla. Slowly fold in the flour with a large spoon or spatula, then mix well using the mixer. Shape dough into 3/4 inch balls and roll each ball into the extra 2 Tablespoons of sugar placed in a saucer. You can color granulated sugar with food color of your choice, or use colored sugar crystals. Place balls 2” apart on large ungreased cookie sheet or parchment paper. Flatten each ball into one and a half inch rounds. 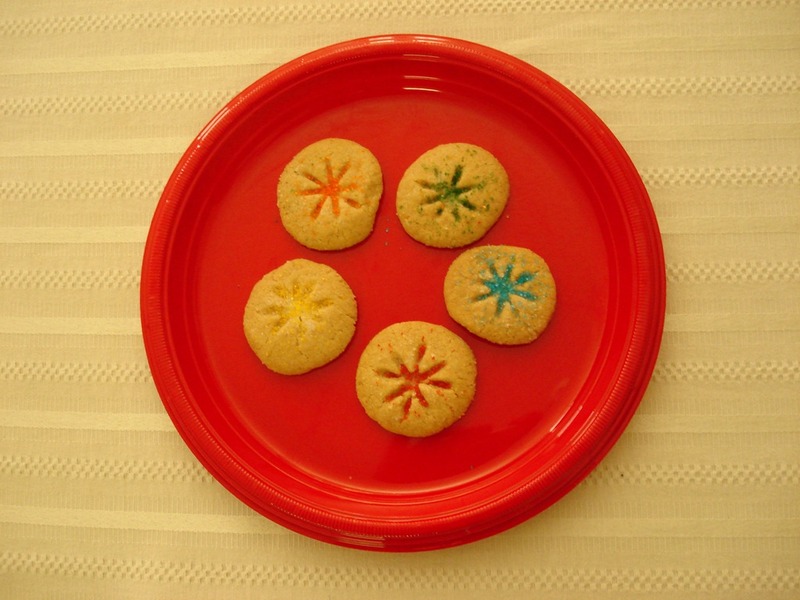 Using any cooking tool lightly press and form a pattern on each cookie. You can use the mixing ends of mixer blades. Bake cookies 10-11 minutes or until edges are slightly golden. Transfer to wire rack to cool. Quinoa is an excellent substitute for couscous in any recipe, and is, of course, more nutritious. Quinoa should be rinsed in a fine mesh strainer. It has a slightly bitter coating which is removed by washing and rinsing. 1/4 cup ( or more) vinaigrette dressing of your choice. Place quinoa grain in a fine sieve. Wash carefully under slow flowing water, rubbing the grain gently as you wash. Drain water. Repeat process 3 times. Heat 1 cup water in a medium pot. Add rinsed, drained quinoa to hot water. Stir and check if you need a little more liquid for the grain to soften and cook well. Add extra water if required, cover and cook on low heat for a few more minutes. Remove from heat and keep covered for 5 minutes or so. Uncover and spread cooked quinoa on a flat dish. Let it cool. In a bowl, combine cooked quinoa with cucumber, bell pepper and green onion. Pour dressing and gently stir it in. The National Academy of Science describes quinoa as “the most nearly perfect source of protein from the vegetable kingdom”. Ancient Incas revered it and called it the “mother grain”. It has nine essential amino acids and can be called a complete protein. For more on quinoa, check the write up on “Grandma’s Gluten Free Flour Mix” in the Cakes, Cookies and Desserts category. Red peppers are a great source of Vitamin C. Peppers of all colors are rich in carotenoids and antioxidants. They make meals more colorful and help us follow one good criterion that a balanced meal must have—as many colors of the spectrum as possible. Every color in food yields different kinds of antioxidants / phytochemicals. A simple vinaigrette dressing is excellent with crunchy leaves. For kids who might find vinegar too tart, there is lemon juice. Vinegar is mostly gluten free, except when derived from barley malt. If malt is derived from any other source, it is usually mentioned on the label. Some of the dressings available on the shelf might be just fine, but please read every ingredient in detail. Whisk all ingredients, then pour on salad. Beat well, using a whisk or fork. Dried or fresh, finely chopped herbs of your choice—basil, oregano, thyme, parsley,—just get creative with flavors. Use lemon or orange zest, berries, cherry tomatoes, grapes, oranges, pineapples—fruits of your choice, with good crunchy lettuce, spinach, arugula and other such green leafy veggies. Vary dressings, garnish with sunflower or pumpkin kernels,serve with cooked meats of your choice, and watch the salads disappear! For half a cup of kernels, use 3 tablespoons of brown sugar. Roast seeds lightly in a pan, add sugar and continue to roast till sugar caramelizes and forms a rich brown coating on the seeds. Remove from pan and cool before adding to salads. These are wonderful alternatives for nuts. Seeds are also rich in vitamin C.
Lightly roasted, roughly crushed flax seeds also create a healthy,nutritious and crunchy topping. Mayonnaise is just off the list for most people with allergies. But try this delicious alternative, which is a great substitute for the original. In a small saucepan, heat 3/4 cup milk. Mix corn-starch into remaining 1/4 cup milk. When the milk in the saucepan has almost come to a boil, add the cold milk-corn-starch mixture, stirring continuously till sauce thickens. When sauce has cooled, add remaining ingredients and chill. Use with potato salad, chicken salad, wheat and gluten free macaroni, and anything else you fancy. Chef’s tip: Add a dollop of sour cream before using the prepared ‘mayo’. To one cup gluten and egg free “mayonnaise”, add 1 Tablespoon finely chopped green pepper, 1 Tablespoon very finely chopped green onion, and toss in another Tablespoon of finely chopped olives or pimiento. You have just created an allergy free Thousand Island-like dressing! This is great to use, especially for dairy allergic people. It is high in monounsaturated fatty acids, Omega 6 and the Omega 3 fatty acids. Nutritionists recommend extra virgin olive oil, as the process through which it is obtained ensures retention of maximum nutrients. It has the highest percentage of monounsaturated fatty acids. Extra virgin olive oil is ideal for salad dressing, while virgin olive oil is good for cooking as it has a higher smoke point. These are good sources of Vitamin E Buy kernels, as seeds have a husk like covering which needs to be removed. It is always good to lightly roast sunflower kernels. Pumpkin seeds are high in zinc. they give us essential fatty acids and protein when eaten raw. Flax seeds are a great source of Omega 3 fatty acids, and are excellent for those who cannot have fish. Flax meal is convenient to buy, as dehusking and coarse grinding is not necessary. Flax meal is best when lightly roasted and stored in an airtight bottle in the fridge. Flax can turn rancid very quickly. Make sure that the mustard you buy is gluten free. English mustard is also made from white mustard seeds but has a greater pungency. It is sometimes mixed with wheat flour for bulk and has turmeric for color. It is important to watch out for any wheat ingredient before using this mustard. Dijon mustard is made from husked black mustard seeds blended with wine, salt and spices. It is necessary to find out from the manufacturer whether wheat or gluten ingredients have been used in the wine fermentation process. This wonderfully refreshing, ‘fruity’ salad can actually be made a day ahead, and kept overnight in the fridge—ideal to serve along with birthday eats or to add color and flavor at a luncheon. This recipe actually comes from my American ‘Mom”, Happy Hopkins. I have modified it a little to suit special food needs. Combine sugar, corn-starch, cardamom and water in saucepan, and stir to blend. Over low heat, stir mixture. gradually adding pineapple liquid, until mixture is thick and clear.let sauce cool. 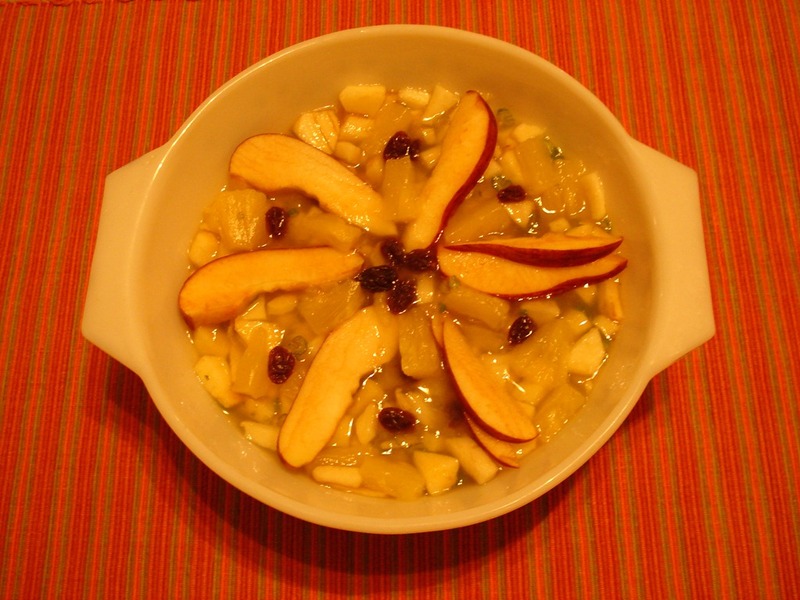 Combine apple, celery and pineapple in a bowl and pour cool sauce over them. Decorate with cherry halves and serve. Variation: Use chopped dates to mix in and also for decoration, instead of cherries. One apple has more fiber than a serving of oatmeal. A medium apple has nearly 160 g of potassium, like oranges and bananas. Researchers in the UK say that kids who are big apple eaters have better lung function and are at a lower risk of asthma. An apple a day just might keep the doctor away! Some fruits such as pineapples (along with papayas and mangoes) contain certain protein breaking enzymes which can attack the mast cells which are part of the body’s immune system. Nutritionists recommend that these fruits should not be eaten on an empty stomach. Canned pineapple is generally safe as the heat used in canning destroys this enzyme. Use caution when introducing a never-before-tried fruit.